When I recently watched NDTV’s Special Feature on the Jarawas of the North Andaman’s focussing on the exploitation of human innocence by a film maker, I was reminded of another incident with similar nuances, performed at the Scala Theatre, West End London in November 1924! The hall was packed to capacity. Well, who would want to miss a chance to see monks from the Forbidden Country, upon the Roof of the World? There was an eerie silence when curtains parted and Captain J. B.Noel walked on to the stage, leading 11 Tibetan Lamas in their bright yellow robes. Unmindful of the audience, the head Lama promptly led a prayer invoking the Buddha’s blessings. Minutes later, they reappeared in colourful costume and fearsome masks, to perform a traditional monastic dance to a medley of Tibetan drums and thigh-bone trumpets. The 15-minute performance was an experience of a lifetime for the theatre-loving Londoners, especially as it was the first of its kind ever. 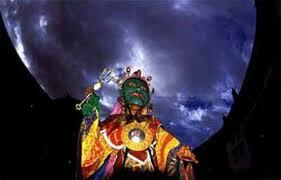 News about this performance was slow in reaching Lhasa but when it did, all hell broke loose. Apologies from the British Political Department were rejected and all diplomatic ties were put on hold. After all, the actors were not just ordinary monks… they were the ten senior-most monks from the Pelkor Chode Monastery at Gyantse, Tibet, the third highest in precedence; what’s more they were led by their Abbot! Equally infuriating for the Tibetan authorities was the unresolved riddle as to “by whom and how were the monks spirited away”? For a start, the British Trade Agent at Gyantse (mid-way between Nathu-La and Lhasa) was declared persona non grata, forthwith. Next, a few Tibetan heads rolled summarily, for sure. The British Government attributed the faux pas to Captain Noel’s misplaced zeal of recompensing the monks, for their unstinting participation during the filming of the British Everest Expedition 1924, the first film on Everest to be seen on screen by the world at large. As for the monks’ enthusiastic acquiescence in the enterprise, they were simply driven by the excitement of the filming per se and the sea voyage to watch its screening in England! Now the Everest Committee (an affiliate of the Royal Geographic Society) had welcomed the idea of the Everest on film, hoping that it will off-set some of the expenses. And Capt. Noel decided that the portrayal of monks within the scheme of The Film, would earn even better box-office returns! And what better coupe for the film-launch in London than the stage presence of the monks per se, whenever and where ever it was screened in the U.K.! The most exclusive screening was arranged at the Lambeth Palace, the residence of the Archbishop of Canterbury. As appropriate to the occasion, the Archbishop gifted a rare, illustrated edition of the Bible to the Gyantse Abbot. However by the next morning, the Bible had been dismembered into eleven equal parts in all innocence, one for each monk! Perhaps a similar treatment of the objectionable Jarawa film would help remove the offending sequences and bury the controversy, for good. Stunning history - Tib. CHAM in London back in year 1924!